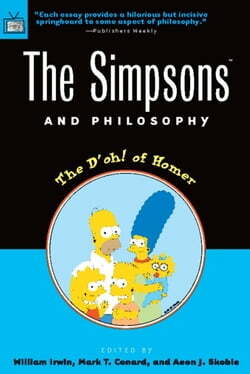 This unconventional and lighthearted introduction to the ideas of the major Western philosophers examines The Simpsons -- TV's favorite animated family. The authors look beyond the jokes, the crudeness, the attacks on society -- and see a clever display of irony, social criticism, and philosophical... read more thought. The writers begin with an examination of the characters. Does Homer actually display Aristotle's virtues of character? In what way does Bart exemplify American pragmatism? The book also examines the ethics and themes of the show, and concludes with discussions of how the series reflects the work of Aristotle, Marx, Camus, Sartre, and other thinkers.